Roots rock served straight up with jangling guitars and a chaser of melodies that evoke the independent spirit of Rock and Roll. Verve Daddy is a group of five guys with rock and roll, blues, country and garage roots, based in Northern Ohio. In late 2008, they took a break from playing live to complete their first album of original music. 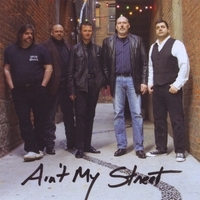 The end result is a CD, titled "Ain't My Street". Each song is unique and diverse, yet they are connected in themes that span decades. Verve Daddy play with the energy and enthusiasm that makes Rock and Roll different from any other art form. The sound is a roots rock, classic sound with many comparisons. (The Heartbreakers, Creedence, The Who, The Stones and more modern comparisons to the Smithereens and the Black Crows, and Cracker) The five members of Verve Daddy bring years of club, recording and songwriting experience from a complex blend of backgrounds. The best way to appreciate Verve Daddy is to listen to the CD and spend an evening rocking with them.